Mr. Gaskins [one of the creators of PowerPoint; see below] reminds his questioner that a PowerPoint presentation was never supposed to be the entire proposal, just a quick summary of something longer and better thought out. He cites as an example his original business plan for the program: 53 densely argued pages long. The dozen or so slides that accompanied it were but the highlights. Now grade-school children turn in book reports via PowerPoint. The men call that an abomination. Children, they emphatically agree, need to think and write in complete paragraphs. How do you set people on fire? His field is almost sui generis, containing bits and pieces of art direction, data-crunching, economics, historical research, and plain old expository writing. It’s often labeled “information architecture,” or “analytic design.” Tufte himself describes it many ways, but one is drawn from a classic piece of science writing: “escaping Flatland,” or using paper’s two dimensions to convey several more. Tufte’s obsessions and coinages: Content-light splashy graphics, or “chartjunk,” are bad. Little repeated graphics displaying variations, or “small multiples,” are good. Microsoft’s PowerPoint software is an all-conquering monster of crumminess, a threat to life as we know it. Most of all, if you are making a presentation, you can probably say everything you need to on a single folded sheet of eleven-by-seventeen copy paper, and you ought to. 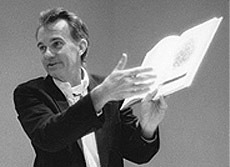 The New York Times Magazine has an excellent profile of Edward Tufte. UPDATE 7-5-07: The Stanford Magazine also has a profile that nicely supplements the NYT’s.